Avoid-a-Roid is a microgame in WarioWare: Twisted! in Mona's stage. It is also played as a minigame in the intro of the game, though it is not played inside the unique handheld appearing there, but rather on a standard Game Boy Advance. The player controls an aircraft-like ship. The objective of the game is to tilt ( ) the GBA to steer and avoid the meteors. 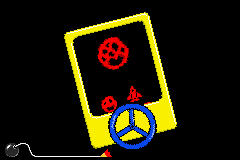 Crashing into them will resulting in losing the microgame. Level 1: Three meteors that fall one after the other in different locations. Level 2: Two small meteors on either side, followed by a larger meteor in the middle, will fall. Level 3: Either one meteor will fall in the center with two others falling more quickly on the sides, or vice-versa. This page was last edited on September 27, 2018, at 14:02.